← 263 "Hungry, Hungry Homer"
Homer is driving a bumper car. Bart and Marge, also driving bumper cars, appear and ram Homer into the wall. "I will not scare the vice president"
"Bye, Bye, Nerdie" is the sixteenth episode of Season 12 and aired on March 11, 2001. The episode was written by John Frink and Don Payne and directed by Lauren MacMullan. "Lisa's attempts to befriend a new student at Springfield Elementary result in constant bullying, leading her on a crusade to find out just what makes bullies tick." A new kid named Francine Rhenquist comes to school and she is very shy, so Lisa decides to talk to her, but is beaten up. Lisa continually tries to find methods to become the new girl's friend, but is always beaten up. 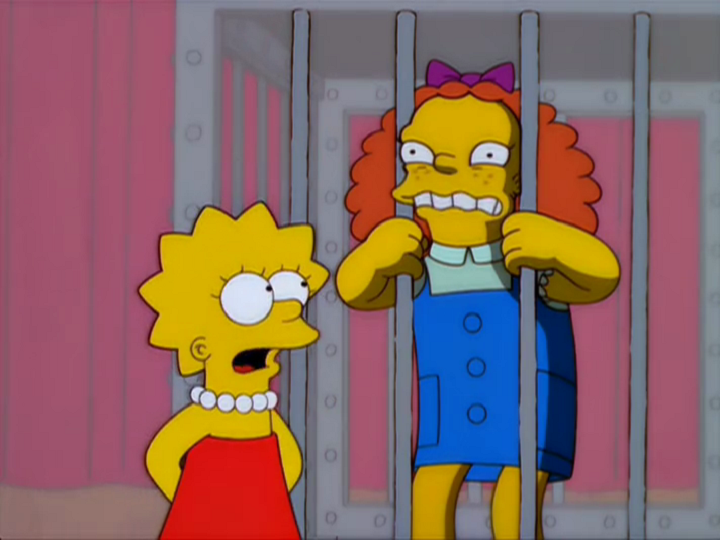 Lisa then tries to enlist the aid of the other bullies, but they refuse to beat up a girl. Lisa wonders why Francine only picks on the geeks and nerds, a question to which Nelson can provide no answer. Lisa asks Groundskeeper Willie if she could see the schools security tapes for any clues. She notices that Francine seems to know where Lisa is, and sometimes doesn't attack her at all. Wendell then pukes and Willie leaves to take care of it. Lisa realises that Francine was nice to her because the girl had nose plugs in. Francine then enters the room and beats her up. Willie then gives a thumbs up at the camera. Lisa then has Martin, Milhouse, and Database exercise to collect their sweat. She brings the sweat samples to Bart's classroom, where Dredrick Tatum is giving a lecture. She convinces him to let her swab a small amount of the sweat on him - this causes Nelson to involuntarily stand up and try to beat up the former heavyweight champ, unable to control his fists. Lisa takes her findings to the '12th annual big science thing' where she reveals the cause of why bullies beat up nerds. Nerds emit a pheromone Lisa calls 'poindextrose' which causes Bullies to become violent towards them. This proves that nerds and bullies are genetically predisposed to be what they are. Lisa then tests the experiment on Francine, managing to render the girl harmless by spraying herself with salad dressing (which covers up the 'poindextrose' scent). Lisa wins the award, but once they run out of salad dressing, Francine goes on a rampage and hurts every nerd at the convention. A baby protection company visit the Simpsons household, to tell Homer and Marge how unsafe their house is for babies. Homer kicks the representative out after being told the outragous costs to baby-proof their home. He decides to protect Maggie himself, and is so successful that he decides to open his own baby protection business. This causes all the baby injury related industries in Springfield to go into decline. Modified on June 3, 2018, at 13:42.